Diffuse Optical Tomography (DOT) and Imaging (DOI) are non-invasive techniques that utilize light in the near infrared spectral region to measure the optical properties of physiological tissue. The techniques rely on the object under study being at least partially light-transmitting or translucent, so it works best on soft tissues such as breast and brain tissue. By monitoring spatial-temporal variations in the light absorption and scattering properties of tissue, regional variations in oxy- and deoxy-hemoglobin concentration as well as cellular scattering can be imaged. Based on these measurements, spatial maps of tissue properties such as total hemoglobin concentration, blood oxygen saturation and scattering can be obtained using model-based reconstruction algorithms. DOT and DOI have been applied in various deep-tissue applications including breast cancer imaging, brain functional imaging, stroke detection, muscle functional studies, photodynamic therapy, and radiation therapy monitoring. 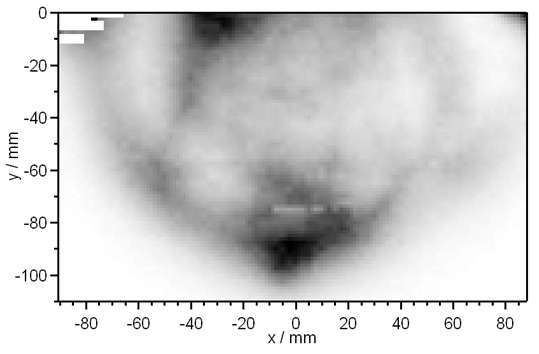 Diffuse optical tomography and imaging can be performed with different experimental approaches. 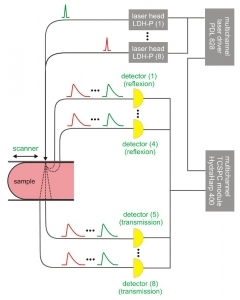 One often employed set-up uses time-resolved excitation and detection schemes, in which multiple picosecond diode laser pulses are introduced into the tissue under study. The laser pulses are broadened and attenuated by the various tissue layers. 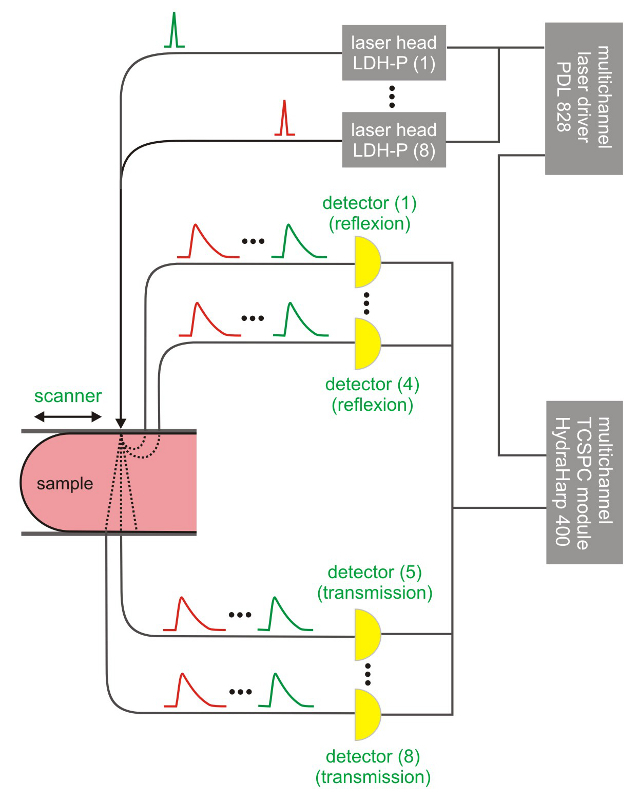 The resulting temporal profiles are then detected at multiple locations as the laser pulses leave the tissue using the method of Time-Correlated Single Photon Counting (TCSPC). By analyzing the shape of the transmitted pulses and by applying physical models, absorption and scattering properties of the tissue are estimated, which can then be used to generate images of the tissue under study. An alternative method introduces an additional fluorescent contrast agent, that is applied to the tissue under study. These fluorescence molecules are excited, and fluorescence photons are emitted. In this case the detectors additionally record the fluorescence light, and one can determine the spatial distribution of the contrast agent in the tissue. The following list is an extract of 10 recent publications from our bibliography that either bear reference or are releated to this application and our products in some way. Do you miss your publication? If yes, we will be happy to include it in our bibliography. Please send an e-mail to info@picoquant.com containing the appropriate citation. Thank you very much in advance for your kind co-operation.